My kids and I usually make some kind of handmade ornament every year at Christmas. 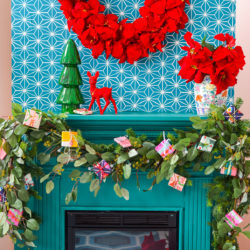 Little painted green trees with clothespin bases and glued-on sequins were one year’s project. Then there was the year of the silver pipe cleaner circles with plastic pony beads threaded onto them, among other sweet decorations. Many such handmade ornaments cover our tree and house at Christmas time and I love thinking about years past when we bring the ornament boxes down from the attic and crack them open each December. But my kids’ winter break began last week, Christmas is upon us, and until yesterday, we hadn’t made a single handmade ornament this year. Too much busyness should NOT get in the way of our tradition, so even though we’re late in the decoration game this year, I wanted to come up with something quick. 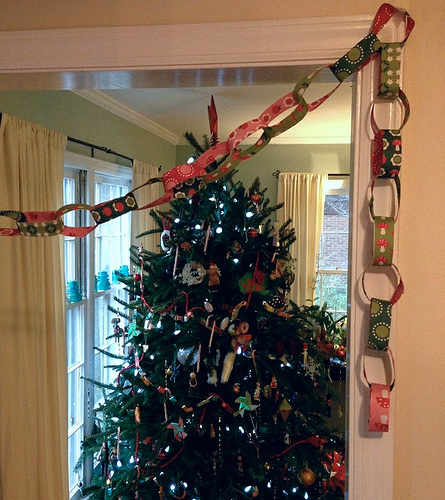 Fortunately, a fabric chain garland fits the bill. 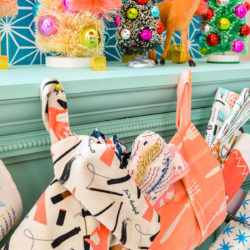 It’s fast, doesn’t require busting out the sewing machine, is kid-friendly, and uses up any stray 8-inch test swatches you might have lying around. 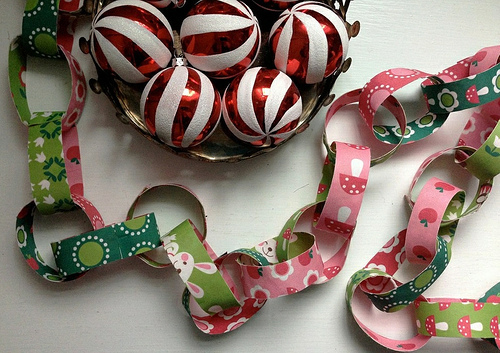 Ready to get started on this down-to-the-wire Chrismtas decoration project? Let’s do it! First, trim off the unprinted white areas of the 8-inch swatches and press them. 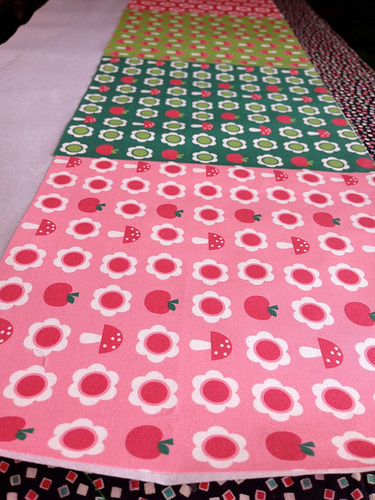 The links of this fabric chain will have printed fabric on both sides so decide now how you’ll pair the prints up. I paired different colors together so there would be some contrast between inside and outside fabrics, but you could certainly opt to pair them in a more matchy way. 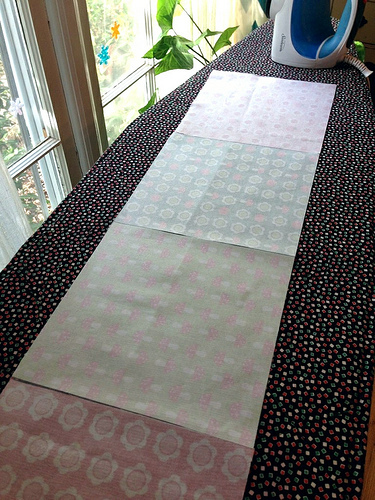 Next, unroll the double-sided fusible web and peel back the first layer of paper backing. (There should be two paper backing layers.) Tile the five 8-inch swatches you want to use as side one of the chain tops side by side in a row and print side up, with no space left between them. 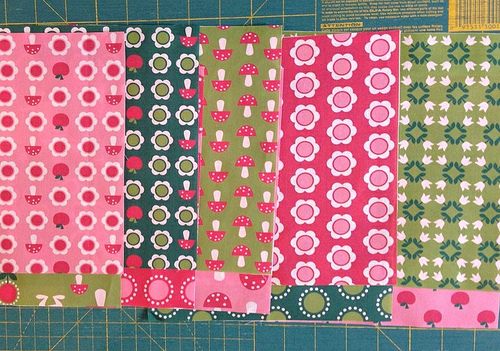 The fusible product I used is pressure sensitive, meaning that I could lightly stick the fabric squares into place and reposition them as needed before fusing them permanently with the iron. 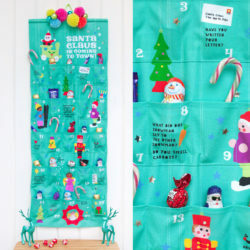 Once these first five swatches are laid out in a line, press them with an iron as directed on the product instructions to adhere the fusible web to the wrong side of the swatch row. 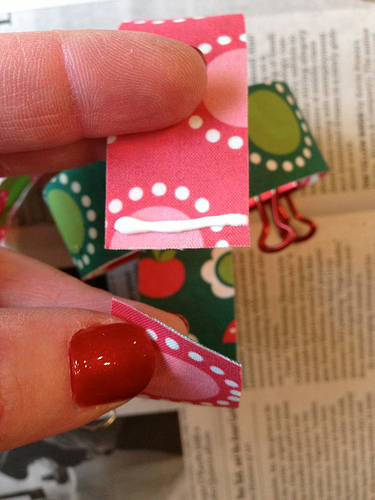 Trim the excess fusible web and paper backing from the swatch row. Check to be sure that the fusible web is adhered to all parts of the swatch row. Re-iron areas that seem too loosely adhered. 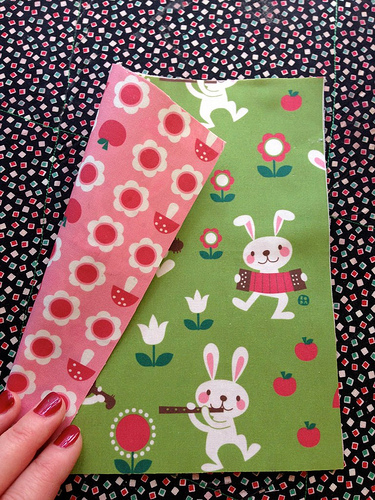 Flip the swatch row over now and carefully peel away the second layer of paper backing from the wrong side. Be sure not to peel up the fusible stuff, too! Now tile the second set of five swatches on top of the first set with wrong sides together, aligning all edges. Press again to adhere the fusible web to the back of the second set of swatches and to fuse the two sets of swatches together. Here’s where a press cloth may come in handy since you may have stray smidges of fusible web sticking out here and there that will gunk up your iron if it makes contact. Once this second row is fused to the first, you can separate the five sets of swatches from each other. I could just gently pull them apart; no need to cut yet. You’ll have five 8-inch squares with print on both sides. If you see any stray bits of fusible web sticking out from the sides, trim those off. Again, check to see if there are any areas that seem loosely adhered and re-iron them if necessary. Cut each 8-inch square into 8 1-inch strips. 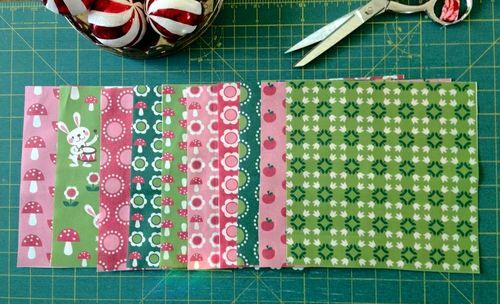 The fastest way to do this is with an acryclic ruler and rotary cutter, and you can stack them into sets of two to go even faster. 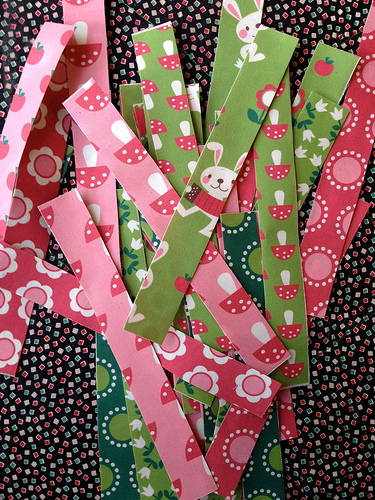 You’ll end up with a pile of 40 double-sided fabric strips. Now you’re going to turn the strips into chain links! 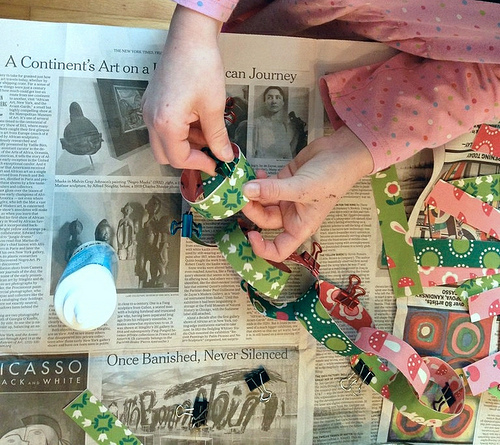 Lay down some newspaper to catch glue drips and have ready the fabric strips, glue, and binder clips (or clothespins or Clover wonder clips). 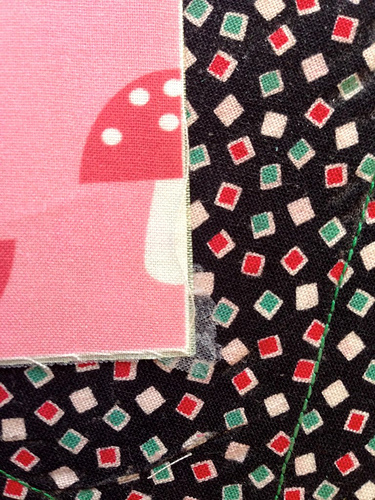 Lay a thin line of glue across one end of the first fabric strip, about 1/4 inch from the edge. Overlap the other end of the strip to form a circle and clip it to hold it together while the glue dries. 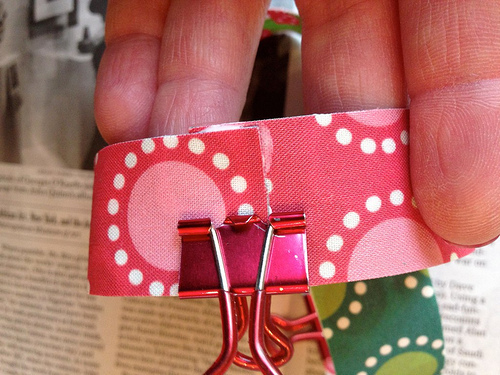 Add more links in this manner to build a chain, clipping each link to hold the ends in place while the glue dries. Here’s where I realized how kid-friendly this project was. My two younger daughters, ages 5 and almost-eight, noticed what I was doing and came over to help me. The older of the two girls insisted that she could finish the whole chain on her own after I’d done only the first few links, and then proceeded to do it. 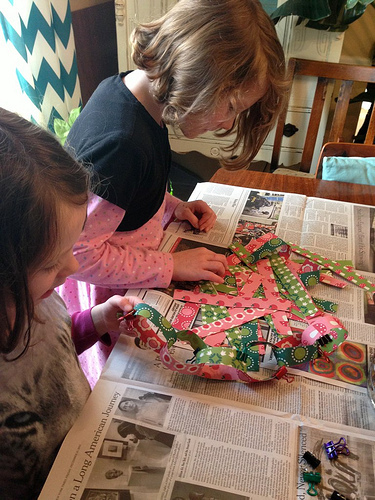 I had no idea she was such a proficient crafter’–I’m so proud! If you run out of clips while making links like we did, just let the first length dry for 20-30 minutes, then remove the clips and keep going with the next length of chain. 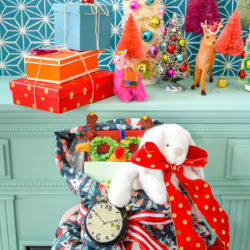 When everything is dry, remove all the clips, hang the chain on your tree or in another place that needs a festive touch, and admire your handiwork–this year and in all the years to come. Merry Christmas to those of you celebrating, and we hope you’re all enjoying a happy and peaceful winter break!